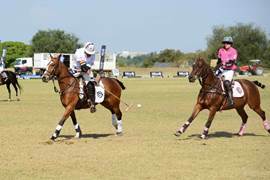 The eagerly awaited Cell C Playing for Pink Ladies Invitational Polo Event will once again grace the fields of the Inanda Club in Sandton on Sunday, 2 October 2016. This world-class event will see celebrities, socialites, sports personalities and the fashion forward descending on the grounds for a day of pampering, high fashion and the thrill of the adrenaline-fueled polo match line-up, with all teams comprised solely of female players. The event is aimed at raising funds for Reach for Recovery’s ‘Ditto Project’, an initiative that benefits women from low-income groups who wish to undergo reconstructive surgery to get breast prosthesis after suffering from breast cancer, but don’t necessarily have the means to do so. Visit the pop-up stores for a luxury shopping experience, get your dose of fashion inspiration at the live catwalk shows, or simply take some time out to lounge in luxury, enjoy gourmet delights and indulge in a much deserved cocktail or a glass of French champagne. In addition to live surprise entertainment acts, there will be many famous faces in attendance representing Cell C Playing for Pink as official ambassadors at this not-to-be-missed glittering affair. “We at Cell C continue to focus our CSI initiatives on the empowerment of women in our country and Cell C is honoured to again be part of this wonderful event in aid of supporting the recovery of breast cancer survivors”, says Suzette van der Merwe, Managing Executive of the Cell C Foundation. Cell C Playing for Pink provides the perfect opportunity to experience an endless supply of glitz and glamour while rubbing shoulders with the country’s A-list. A guaranteed feast for the senses, it promises to be the most unforgettable summertime event on the city’s social calendar. Tickets are available at TicketPro. For corporate hospitality or any further information please contact Edith Venter directly on 011 783 5887 / www.edithunlimited.co.za.